Please Click Here to read the previous parts of this story..Now continue reading this part..
During those dark hours of early morning in Naimisaranyam.. Carefully throwing the light from the torch light in his hand,on those vulnerable areas of the bathroom, the mystic Brahmin Nemani Subbarao started checking every small hole in the room to see if there were any dangerous creatures hiding inside them..
And..Then it happened..Right behind him..And a startled Subbarao quickly turned back.. While Subbarao was deeply engrossed in his search work,his mind was completely under the control of a great fear..It was for that reason that he immediately turned back,startled,after listening to some noise behind his back..Right behind his back..
Having turned back,Subbarao quickly ran his eyes through the entire stretch of darkness that was spread in front of him that moment but to his utter shock he found nothing there..Literally nothing..
Was there really nothing..?? ?..Or was he thinking so..??.. As he was thinking so,he again heard that noise..And again he was startled..And again he found nothing.. But it was that time.. He quickly folded his hands in Her honor and with great reverential attention started listening to her..
And this was what the smiling voice of the divine Mother said..
“Dear Subbarao..Am really impressed with the way you have come this far and conducting your penance here; despite this being a dense forest with so much of darkness all around..However,it was with a divine intention that I have send you here Subbarao knowing well that life here wouldn’t be as easy for you as it is in your city..
Subbarao,who was until a few seconds ago,in a semi solid state now went into deep frozen state with what the divine Mother had told him that moment.. In fact Subbarao,at that divine moment,was like the Vedanthi or the philosopher whom His Holiness Jagadguru Sri Sri Sri Adi Sankaracharya had described in His “Nirvana Satakam” also called the “Aatma Satakam”,which is a six stanza summary of His Advaitha Vedantha or the non dualistic philosophy..
After that divine experience,there was never a single moment,during that entire stay of Subbarao in the dark forests of Naimisaranyam,where he succumbed to fear,at least once..
Later,a fully rejuvenated mystic Brahmin Subbarao quickly finished all his morning activities and sat down unmoved,for more than two hours,in a blissful mediation of the Gayathri manthra.. Although Subbarao,with the assurance given to him by Goddess Mother Gayathri,remained unruffled thereafter in those forests,the same cannot be said about his other accomplices..Things were getting worse for them day by day making their living miserable there.. While hundreds of mosquitoes torture them during the nights and spoil their sleep,thousands of jungle houseflies and dragon flies torture them during the day,knocking the stuffing out of them.. In addition to that,living constantly under the threat of an unforeseen doom would be more punishing for anyone than the actual doom and it was exactly what was happening to each one of them there..
After several hours of waiting and several more rounds of discussions,they all have come to a conclusion that staying there in those forests counting every minute is not any more possible and they should all call it ‘quits’ and leave that place at the earliest..
As was always usual with him,Subbarao,using his veto powers,completely vetoed their decision..Just because they could not say anything harsh against his decision they all kept quiet and had decided to drag life to the best of their abilities a bit more there everyday..
To keep them all in good stead and cheerful moods,Subbarao on one fine morning,after the completion of his daily meditation of the Gayathri manthra,took them to a few of the most prominent places in and around the Naimisaranyam forests.. These places include Kali Mandir,Chakra Teerth and the Goddess Lalitha Devi temple among a few others..After taking a holy dip in the sacred Chakra Teerth,the entire holy gang of Subbarao,Venkata Lakshmi and seven others visited the ancient Goddess Lalitha Devi temple there..
After having the darsan of holy Goddess Lalitha Devi,while everyone went to see the place in and around the temple,Subbarao sat right in front of the Garbha Griha of the Temple staring straight into the eyes of Goddess Lalitha Devi.. The eyes of Goddess Lalitha Devi were serene,gentle and mercy filled at that moment,staring straight at Subbarao’s face…There was a gentle smile in the Goddess Mother’s eyes which only Subbarao could notice.. Looking at those eyes of the holy Goddess Lalitha Devi,Subbarao suddenly felt tremors of goosebumps all over his body..And at the same his mind too reminded him that amazing and hair rising incident that occurred in the Sagara Durga Temple at Visakhapatnam.. But what was that incident..And why did it occur..?? Before knowing that,it is important for you all to go back to the year 1973 and know a few life changing incidents that have completely changed the life of Subbarao in that year.. (..If my observation is right,it was from this year that Goddess Gayathri started playing Her divine game, in the life of Subbarao,which he must have realized only after a few years.. This incident wouldn’t have seen the light of the day today if I had not put one question to Sri Subbarao, that night,which I have very casually asked during one of the many lengthy conversations I had with him .. This incident would have remained so,in oblivion forever,and wouldn’t have enabled the readers know about it just because no where in the diaries of Sri Subbarao had sent me,this incident was mentioned..
May be because it was part of the cosmic design – that I should know about this incident first and then share it with my readers – that I have asked Sri Subbarao that question,that night..
During that year of 1973,Subbarao was waging a tremendous battle with life not only to make both of his ends meet but also to take his beloved siblings to the next level in their life.. Living in a small rented house,along with his large family of both his parents,brothers and sisters in the Dondaparthi area,a lower middle class area in Visakhapatnam city,Subbarao would offer Mathematics tuition classes to students for almost fifteen hours in a day..
More or less he was the sole bread winner to that pretty large family and would really work very hard to provide bare minimum comforts of life not only to his beloved parents but also to all his dear brothers and sisters..
During those days,Subbarao never had his dinner before 11.30 pm on any given day..However,he never complained against life nor against anything in his life..He knows well that he cannot any how change his past but would certainly ruin his present by unduly worrying about his future.. So he went about living for one day at a time of course with a little planning not for his future but for his beloved’s future.. In those days,there was an elderly Brahmin lady residing in a house next to Subbarao’s house..She used to observe Subbarao’s struggle for existence and also his indefatigable love for his family..
Those were the divine moments that completely changed Subbarao’s life forever..Or may be those were the moments that Goddess Laltha Devi had come in the form of that elderly lady and blessed Subbarao..
No matter what the significance of those moments were,Subbarao,without any delay commenced the recitation of Lalitha Sahasranamam immediately and since then made it a point to recite it everyday..
And this went on for several years..
After a few years,another elderly lady,to whose daughter Subbarao would offer tuition,came to his house personally and gifted him a neatly packed book of ‘Laltha Sahasranama Bhahshyam’ which has in it the sacred ‘Mangalasasanam’ written by His Holiness, the Paramacharya of Kanchi Kama Kothi Peetham, Sri Chandrasekharendra Saraswathi..
Subbarao went into raptures seeing that amazing book and heart fully thanked that lady and prostrated before her feet for offering him such an invaluably precious gift..Did Goddess Lalitha Devi come again to bless Subbarao through that elderly lady that day..Who knows..?? That book had completely changed Subbarao and his life..
After that,he had cultivated a new habit of reciting Lalitha Sahasranamam,believe me,108 times,during the most auspicious days of Ashtami,Navami and Dasami of the Navarathri days of the year..
Moving one foot up and foot down Subbarao’s life started gathering pace..
Gradually his life started changing; his living standards started changing,his bachelor status too started changing but his daily habit of reciting the sacred Lalitha Sahasranamam hadn’t changed a bit..
Now..Let me do a little Mathematics here.. If a person recites Lalitha Sahasranamam everyday it would take about twenty six and half years for him to reach the magical one crore (ten million) time recitation of the same..Then how many long years it must have taken for Subbarao to reach that milestone..??.. Who was doing that Mathematics for him..? ?..And who will tell him all about that..?? Who will answer these questions..??.. In the meantime,Subbarao had also commenced the everyday recitation of Gayathri manthra in 1980 in addition to the recitation of Lalitha Sahasranamam..It means he had to spend several hours in a day in recitation of these two sacred texts.. But Subbarao,in his relentless spiritual journey,was undeterred and undisturbed by the challenges of life and went about performing all his spiritual as well as family duties quite judiciously..
On one fine Sunday morning.. Since that was a Sunday and there was nothing much for him to do,Subbarao said “okay”.. So they all decided to go to that temple after an early lunch that day..
Just before lunch in Subbarao’s house,that relative called and said,”we are sorry..due to some urgent work we will not be able to come today..If you wish to go..Please go ahead..”..
Finally,they all reached the Temple and for a few blissful moments had a wonderful darsan of holy goddess Kanaka Durga there.. Since that was a relatively new temple,there wasn’t much rush inside so Subbarao could easily find a suitable place in front of the Garbha Griha of the holy Goddess and squatted down there and closed his eyes..
Then opened his eyes and looked around..
Found a few devotees scattered here and there..
Then lifted his head and looked all around the dome of that beautiful temple..
Then noticed a cool gentle breeze coming from the near by Bay of Bengal sea.. Except an occasional sound of a few medium sized waves coming and hitting the Vizag coast there wasn’t any other sound there.. There was also great divinity in the whole atmosphere all around the temple.. Trying to draw that divine energy unto him,Subbarao closed his eyes again.. Felt the serenity of the temple atmosphere deep inside him.. Someone rang the small Bronze bell hanging in front of the Garbha Griha of the holy Goddess..
Suddenly,there were waves of some divine musical waves all around.. But not to that musical sound of those Temple bells but to something more mythical,more musical and more divine.. He was listening focusing all his aural energies on what he was listening.. He was listening to the mesmerizing divine female voice for the second time in his life after he heard it for the first time in 1980 when it asked Subbarao to recite the Gayathri manthra..
And this was what the divine voice was telling Subbarao,that moment..
Subbarao was listening as the voice continued..
“.Although you are reciting Lalitha Sahasranamam once everyday,on a Pournami day (the full moon day) however you are reciting it twice but you have counted only once until now..Secondly,you forgot to recite it the second time on one particular Pournami day.. 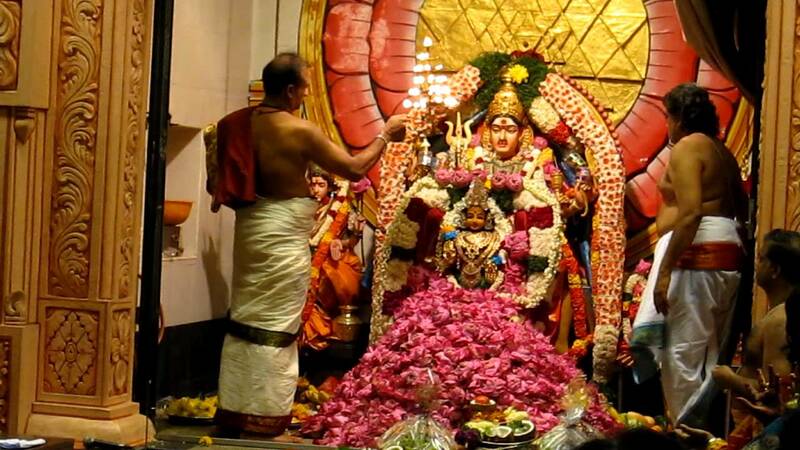 So if you do all that calculation right now,Subbarao,you will very clearly understand that by today you have completed the one crore times recitation of the Lalitha Sahasranamam..
With tears rolling down his cheeks,a fully joy filled Subbarao prostrated before the holy Goddess Kanaka Durga in that Sagara Durgan temple,a one of it’s kind hill shrines in India today..
Later Subbarao immediately rushed to his house.. Took out all his diaries..
Did all the calculations and went into a deep shock after finding the answer..
What the Goddess told him was exactly correct.. It was on that day that Subbarao completed the one crore time recitation of Lalitha Sahasranamam..
Subbarao remained in that shocked state for a pretty long time.. He was surprised to know that Goddess Lalitha was not only observing every moment of his life but was also counting his every recitation.. He then heart fully thanked the holy Goddess..
Now..Here’s the question that I have asked Sri Subbarao that night.. It was then,as a reply to that question.that he narrated me the above incident.. But what if I had not asked that question that night…??? May be we would have never come to know about this divine incident which Sri Subbarao had forgotten long ago.. Even the year of it’s occurrence he was not sure but says,”..I think somewhere between 1988 and 1990..” ..
Unfortunately,Sri Subbarao lost some of his invaluable personal diaries during the shifting of his house in Visakhapatnam..